A hands on exploration of design, techniques, tools, and sharpening, with a Snuneymuxw master carver. The workshop will be held over two morning sessions. 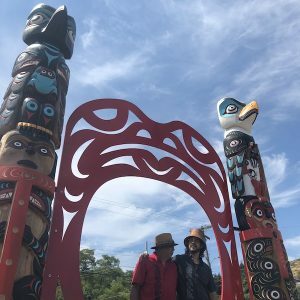 Joel Good carved the new totem poles at Departure Bay and at the Nanaimo Art Gallery. He has makes remarkable bentwood boxes, spindle whorls, masks, and paintings. Patrick Olmsted is an internationally recognized Gabriolite luthier, recently immersed in Coast Salish art under the intense scrutiny of Snuneymuxw Master Artist William Good. 13+ | $110 for 2 sessions | 12 max.